This week I start working on new projects. Ideas for these projects are simple. 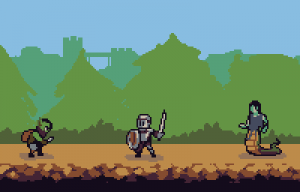 Player go to the right, Fight all enemies, Save Princess or Revenge. I plan to simultaneous making 2 games. It will be experiment for the graphics. Theses projects will have different stories and design but They will have same core game mechanic. I hope I should have playable version at the end of this month.